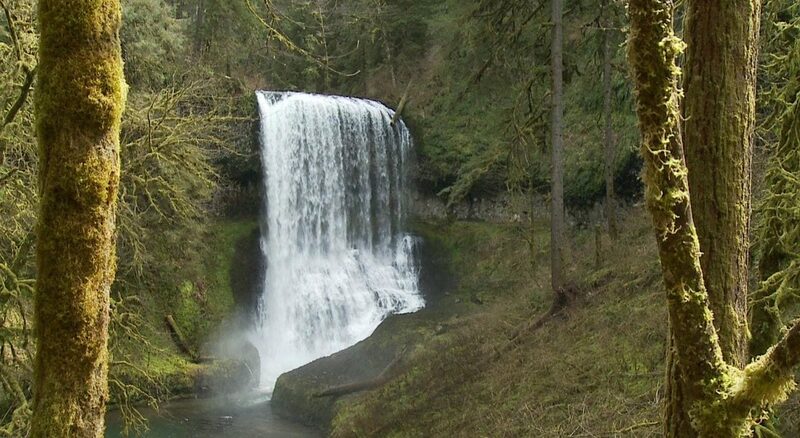 At Silver Falls State Park, fourteen foamy white curtains whirl and ripple and tumble and shimmer at one of the most delightful park lands in Oregon. Adam Bacher, an Oregon resident and noted landscape photographer, said he’s lucky enough to capture the falls from every angle. 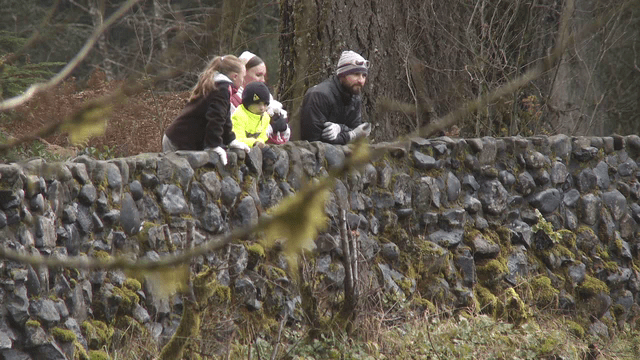 “To me, Silver Falls State Park is like a miniature Columbia River Gorge,” noted Bacher. We held tight to the steel guardrail alongside the ten-foot-wide trail and were just about to duck behind the famous whopper waterfall that’s on the Trail of Ten Falls at Silver Falls State Park. Bacher finds trail hiking is pure pleasure inside Oregon’s largest state parkland. In fact, across more than 9,000 acres, you will find many waterfalls that boom and seem to shout for your attention. Thundering and roaring from recent downpours, the many cascading falls inside the park are immense spectacles to behold. Nestled in the lower elevation of Oregon’s Cascade Mountains, Silver Falls State Park is blessed to be located in a temperate rain forest. The geologic history behind so many falls in one location is impressive! It seems millions of years ago, successive and destructive lava flows covered the entire western region of Oregon. But over time within this parkland, the wind, rain, and ice eroded or cut through the lava to create tributary creeks and their falls, plus the main stem, Silver Creek. So much beauty from long-ago devastation is worth a pause to consider! 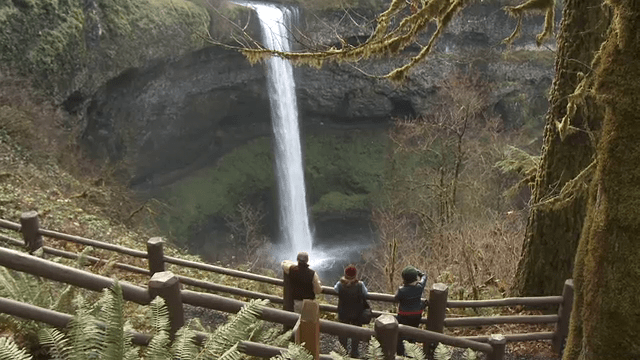 Waterfall watching is certainly easy to come by at Silver Falls State Park and provides a good reason to stay active throughout the winter months. 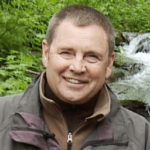 If you take the right precautions with the right equipment, it really is a pleasure to be outdoors all winter long, as we recently learned when I headed indoors to chat with an expert about winter hiking gadgets and gear. When it comes to rain gear, Coppinger said it’s important to try it on in the store with the clothing you plan to wear outdoors so to be certain it’s comfortable. “Gore-Tex” fabric is a time-tested waterproof material that is right at home in Oregon. There are many Oregon guide books to choose from, but one favorite that’s stood the test of time and costs less than 30 dollars is “Fishing in Oregon.” The book provides descriptions and directions to every lake and stream in the state. You can also enjoy a bargain in the Oregon State Parks parking permit purchase this month. Oregon Parks offers a five-dollar discount on an annual parking pass purchase. Another gift idea that’s sure to being a smile: purchase an Oregon Department of Fish and Wildlife hunting or fishing license for a friend or family member. Simply visit any sporting goods store that sells license and provide a person’s basic information and you can buy the license for them as a gift. It’s a great idea and the sort of gift they’ll remember all year long.